Honeywell's LYNX Touch 5200 all-in-one home and business security system was just revealed in Vegas at the 2014 ISC West Security Show on April 2, 2014. Our President Paul Seidman personally attended and saw first hand the new features of the Honeywell Industry leading security manufacture latest product Line up for 2014. 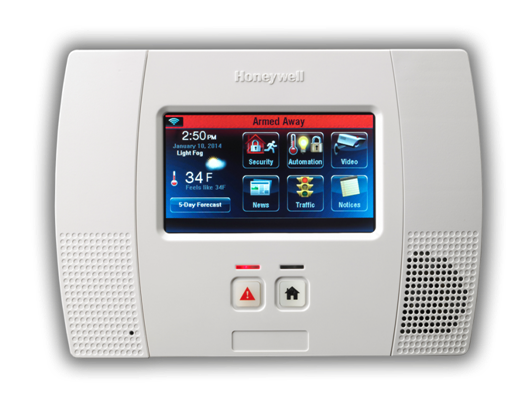 The Honeywell LYNX Touch 5200 is the newest security system released by Honeywell. Replacing its reliable predecessor, the well-known LYNX 5100, The LYNX Touch 5200 has some welcomed new security features to the LYNX Touch line of wireless security products, including the ability to view video on the system's new, bright, high-resolution 4. 7" LCD screen via the Honywell IP CAM-W12 wired or wireless IP camera. The LYNX Touch 5200 has the ability to be monitored over WIFI or GSM, or, if you'd prefer, it can be monitored using dual pathways for additional high end homes that want security typically not avaialble from all security providers. Designed totally with the end-user in mind and not just for our installers, like some of the more complicated wired panels, the L5200 is simple to program and configure making the Honeywell LYNX Touch 5200 the best security system ever made by Honeywell. It is capable of monitoring 84 total zones, just like its slightly more robust wireless contemporary the Honeywell 7000 which is also new for 2014. The unit is a full-featured system with Honeywell's legacy in mind, continuing the company's commitment to Z-Wave technology. With the simple addition of the LYNX Touch 5200's z-wave module, this unit can easily be made the brains of your home, controlling both your security system and satisfying your home automation needs and making your home safe and fun to be in. Let us configure your LYNX Touch so you can control your complete security system from anywhere in the world. Honeywell's LYNX Touch 5200 all-in-one home & business security system features a bright, 4.7" full-colour touch screen with graphic icons and intuitive prompts for easy operation. The most pronuced change right off the cuff is the new sleek design with two dedicated keys for easy access to the home screen and emergency features at the touch of a button. It features on-screen video, Z-Wave automation capacities, including advance alarm communications, garage door notification and control including tornado alerts for U.S.. and Canadian residents. The New LYNX Touch 5200 is flash upgradeable so you never left with security that can't move forward when you need to upgrade. Whether using the new LYNX Touch 5200 as backup or primary communications, the advanced 4G radio improves longevity and maximizes your security for your home and business around the clock. The Z-Wave connectivity module lets our installers integrate security, lighting, thermostats and more for local and remote control. With Honeywell Total Connect remote services our customers can control security, thermostats, lighting, locks, receive real time alerts and more with most Smartphones, tablets and computers from anywhere in the world. Pre-Lock Security Services can install wired, wireless or hybrid alarms systems mixing physical wires where possible with high tech wireless security equpment by Honeywell. We can even tak over or upgrade your existing alarm system to meet the ever changing needs of your famiily and home. Protecting your self from burglary has never been easier before. Let us configure your alarm system to include door sensors, window sensors, motion detectors, glass break sensors andmore. Add monitored detectors for smoke, carbon monoxide, flood, sump pump overflow and temperature changes.